Television producer, host, trapper and adventure bowhunter Tom Miranda is no stranger to outdoorsmen. In the mid 1980’s Miranda gained notoriety as a professional trapper who offered trapping lessons on VHS video. Miranda was a pilot and used his small airplane to operate his trapline, a novelty that made his video instructions popular. Also a bowhunter, Miranda began making hunting videos and by 1992 had his own adventure TV series on ESPN. Self taught in TV production, Miranda would hire a freelance cameraman to tape his adventures then write, produce and edit the programs himself. Tom soon became know on ESPN as the crazy bowhunter who would do anything as his adventure show featured adrenaline stunts like sky diving, bull riding and bungie jumping…..along with his bowhunting. 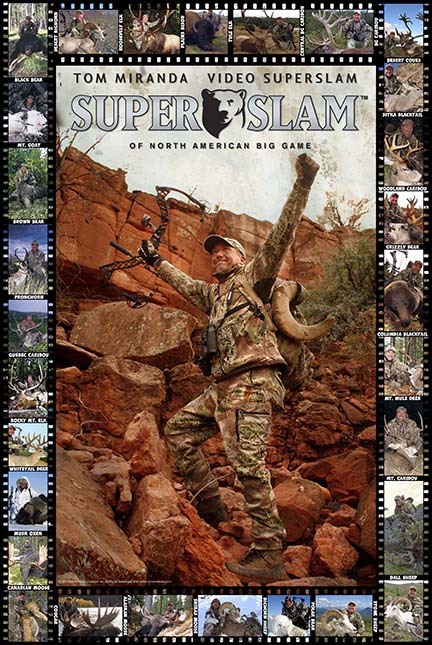 In 2011 when Miranda completed his 13 year quest to capture the archery Super Slam on video, SCI Record Book officials contacted Tom about his hunting accomplishments. With over 20 years of producing TV bow hunts, Miranda had been scouring the globe bowhunting big game and SCI knew it. A list of species was generated and with some quick fact checking, Safari Club determined that Miranda was very close to accomplishing the World Hunting Award. After some discussion and planning, Miranda had his mounts scored, entered them to SCI and set out to fill the specie gaps in his bowhunting collection. In the last five years, Miranda has went full draw on over 50 big game animals on five continents to complete and receive his World Hunting Award ring. SCI’s World Hunting Award is a prestigious milestone, especially for bowhunters. To date only five archers have qualified.. Archie Nesbitt, Gary Bogner, Byron Saddler,Ricardo Longoriaand Tom Miranda. Unique to Miranda is the fact that Tom has also captured all of his World Hunting Award species on video, complete with the arrow impacts. A feat that attests to Miranda’s dedication to his craft as a television producer, host and bowhunter. 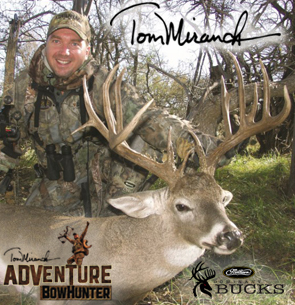 Miranda’s latest DVD series Adventure Bowhunter Dark Continent chronicles Tom’s SCI Animals of Africa archery milestone. More information on Tom is available on Wikipedia or his website.